As reported on CTV News, all signs point towards a balanced provincial budget but the provincial government made it clear it’s unlikely to move on some expansions to the provincial sales tax (PST). 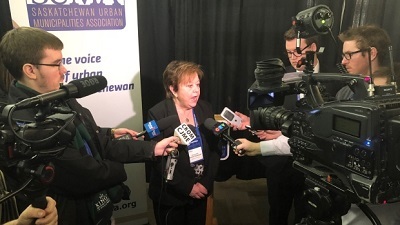 Marking the last day of the 2019 Saskatchewan Urban Municipalities Association annual convention in Saskatoon at TCU Place, town and city council members once again participated in the cabinet bear pit session. It’s the final opportunity for municipal leaders to ask questions to executive council about issues in their communities. Ryan King, a councillor with the Town of Allan, was among many who asked if the province plans to review the addition of PST to overall construction projects, wondering if the province is aware of the added costs to towns and cities looking to kick start infrastructure projects. “Will the government give consideration to removing PST being applied to construction projects,” King asked. Finance Minister Donna Harpauer said adding PST to the overall cost of construction projects was meant to generate new revenue in response to the plummeting revenues from its resource sector. Most provinces do the same and the added cost on average is about 2.9 per cent, she said. The pressure faced by the construction industry isn’t the PST, but the slowdown on big capital projects from the province and its municipalities, she said. “The construction companies I’ve spoken with are just asking, if we can’t come to a balance without addressing the PST, can we at the very least start to address moving forwards with larger provincial projects and that’s what we’re considering in this budget,” she said. New Democratic Party leader Ryan Meili said in the two years since the PST was added on the province has seen 14,000 fewer jobs in the construction industry, which he claims is a direct result of the added cost for these major projects.